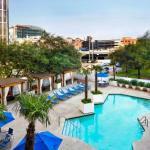 Excellent downtown location, nice rooms and helpful staff. Room service hours limited on weekend. It was nice accept for the bathroom. The bathroom needed to be remodeled. Stayed two nights - perfect for what we wanted. Convenient location - great restaurants around and the hotel one is good - liked the bar. Houston has some of the best restaurants in America. Great location - shuttle very handy - stayed for the aramaco 1/2 marathon - convenient to garb center. The 259-room Crowne Plaza Houston Downtown provides luxury accommodation for both families on vacation and the business traveler. Items included with the room rate at this 12-story, non-smoking hotel are high-speed Internet access, local telephone calls, a morning newspaper and in-room tea and coffee. There are meeting rooms available that can accommodate 500 guests for business or social functions. Area landmarks and attractions include the Houston Zoo, the Minute Maid Baseball Park, Bayou Place Entertainment Center, the Houston theater district, the downtown Aquarium, Hermann Park, Childrens Museum of Houston, the Museum of Natural Science, the Museum of Fine Arts, Rice University, University of Texas Medical Branch, Baylor College of Medicine and shopping at the Rice Village Shopping Center. All the rooms and 18 suites have a work desk with high-speed Internet access, television with cable news and movie channels, pay-per-view movies, CD player, iron and ironing board, hairdryer, coffeemaker and two dual-line telephones with voicemail speakerphone. The suites and executive club level rooms have the benefit of bathrobes and additional space. Connecting rooms are available. The on-site Brazos Restaurant is open for breakfast, lunch and dinner and room service is available from 6am until midnight. The Brazos Lounge is open daily from noon to midnight and has happy hour specials from 5pm until 7pm on weekday evenings. There is a seasonal outdoor swimming pool and a fitness center, gift shop and newsstand, business center, an ATM, shoeshine stand and ice and vending machines. The 24-hour front desk has information or area events and attractions and safe deposit boxes. This is a wonderful hotel with lots of space, both in the public areas and in the guestrooms. Despite its size many guests said there was a homey, friendly atmosphere and the top notch crew of workers provided polite and professional service. There were some minor moans about the high rates. Despite this many visitors said they would stay at this hotel again and had no hesitation in recommending the property to fellow travelers. Words of advice from those who have stayed here: Priority Club members get breakfast for free. So if you are not a member, and plan to stay here, sign up before you go. There is no charge. Parking: Yes, there is parking. It costs $24 per day.